The Platinum Tools 90125 SealSmart Field Installation Kit (Nickel) allows you to store your tools and connectors in a rugged, high-impact, plastic case with compartments to assist in identifying, sorting, and re-stocking all components quickly and easily. Available with nickel-plated connector. If your job requires you to use compression F, RCA, and BNC connectors in assorted cables sizes and you have been trying to figure out how to keep it all organized, this SealSmart Field Installation Kit provides the ideal solution. 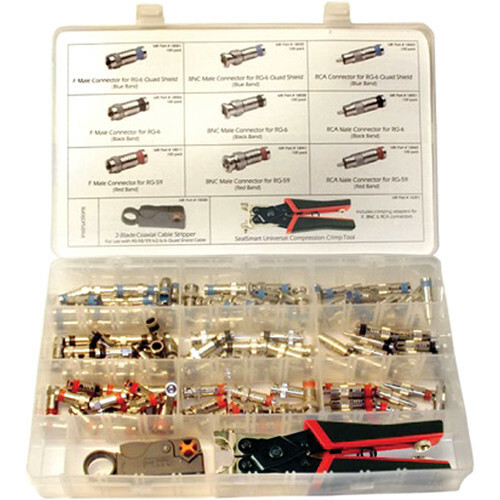 The kit includes the 15030C Coax Cable Stripper (2-Level RG58/59/62/6/6Q), 16201C SealSmart Compression Crimp Tool, and sets of SealSmart F, BNC and RCA connectors in a SealSmart Compartmented Plastic Case. The 15030C Coax Cable Stripper is simple to operate and ensures a professional, repeatable strip every time. These strippers include a hex wrench for adjustable blade depth. Stripping lengths are also adjustable. The 16201C SealSmart Compression Crimp Tool provides simple, fast, and reliable terminations for F-, RCA-, and BNC compression-style connectors on coaxial wires; the tool is an ideal solution for CATV, DSS, security, and residential structured wiring installations. Connector adapters can be mounted on the handle for easy storage. Straight action mechanism provides uniform compression. The SealSmart Connectors for the RG6 Quad Cable provide simple, fast, and reliable terminations. They are the perfect solution for CATV, DSS, security, home theater, and residential structured wiring installations. Box Dimensions (LxWxH) 13.9 x 8.8 x 2.0"